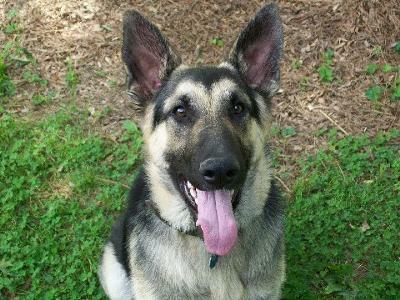 I AM SUBMITTING A PICTURE OF MY GERMAN SHEPHERD , ZORRO , WHO IS 14 MONTHS OLD . HE IS A GOOD NATURED DOG BUT IS VERY PROTECTIVE OF ME AND HIS ''DOMAIN '' WHICH IS A HUGE BACKYARD . HE LOVES WHAT MOST GERMAN SHEPHERD'S DO , AND THAT IS HIS TENNIS BALLS . LOVES TO PLAY FETCH AND WILL PLAY AS LONG AS I WILL AND HE LOVES TO PLAY WITH AND CHEW ON WOOD . PINE CONES , TREE LIMBS , LOGS , ETC. HE CAN BE SEEN AT TIMES DRAGGING TREE LIMBS THAT HAVE FALLEN ACROSS THE YARD . FUNNY THING ! ZORRO'S GRANDADDY , DADDY , AND ALL HIS SIBLINGS LOVE WOOD. I THINK THEY HAVE A TERMITE GENE . IF I SET ON THE PATIO , ZORRO WILL COME UP BEHIND ME AND DRAPE THOSE BIG OL PAWS OVER MY SHOULDERS . HE SOMETIMES GETS IN MY LAP ( which aint no small task since he ways 100 pounds ) ,,,WELL THATS ABOUT ALL FOR ZORRO EXCEPT HIS PICTURE .